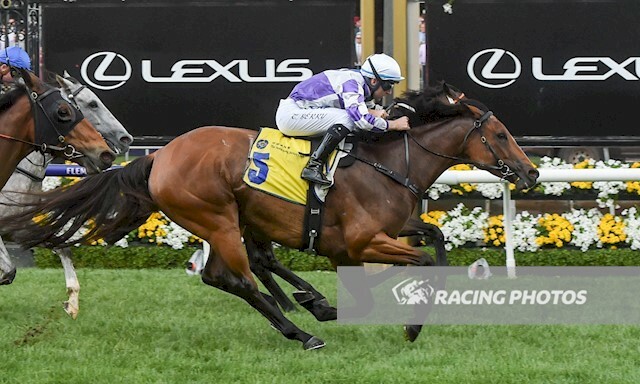 Top mare Cool Passion took her prizemoney past $1/2 million with a game win in the Group 3 $200,000 The Hong Kong Jockey Club Stakes (1400m) at Flemington on Melbourne Cup day, Tuesday, November 6. The victory gave trainer Tony McEvoy a two-state double as he won with the promising Be My Star at Morphettville earlier in the day. Cool Passion ($20), ridden by Tommy Berry, showed great courage to score a neck win from Princess Posh ($8.50) with Savatiano ($3.80 fav) a half-length away third. The seven-year-old mare sat second early before taking the lead in the home straight and refusing to give in holding off her late challengers. McEvoy was proud of Cool Passion who has earned $535,875 in prizemoney. “Today was her 10th win from just 25 starts and I have to thank the owners for being patient with me,” McEvoy said. “Rather than sending her to stud I asked for another season of racing. “I have to thank Jane Henning who bought the mare for John and Anne McDonnell from Perth in allowing me to keep her in training. “I think the secret to her return to form today was the step up to 1400 metres,” the trainer said. McEvoy said the black type Swettenham Stud Stakes at Morphettville in the autumn of 2019 might be a good option for Cool Passion before going to stud next year. Winning jockey Tommy Berry said the mare had put in a tough performance. “She was a bit fierce early and dragged me up to sit on the speed,” Berry said.